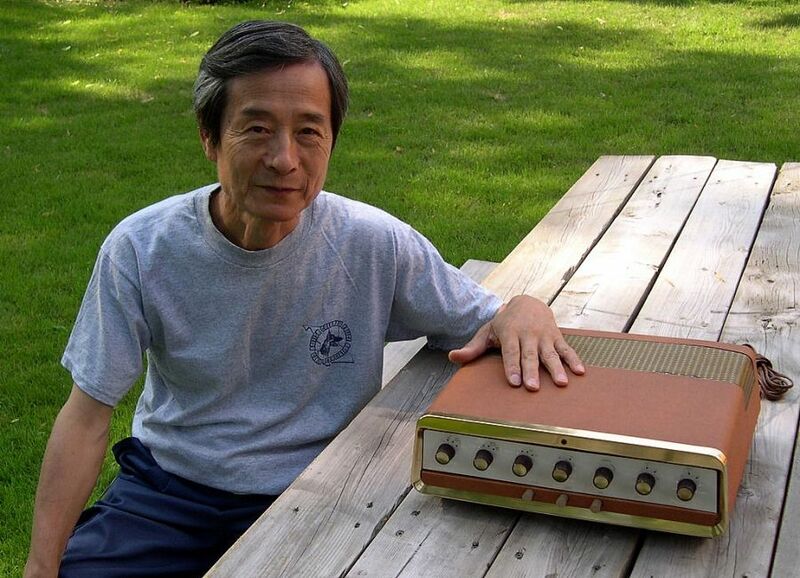 In 1958, when I was 16 years old, I became very interested in electronics, so I began to seriously study the subject and successfully built a five tube super heterodyne receiver with single ended 6V6 output tubes. It was this project that brought me into the audio field. For speakers, I used Rola drivers from the UK. Just imagine, it was only 1960, but already my own custom made components with tubes sounded better than today's semiconductor based systems. After that, I built another unit with 2A3 power tubes. I still remember its beautiful sound quality. It is all a matter of linearity. Wanting to know more, I studied the circuitry of all the world's best audio systems, collecting over 500 famous schematic diagrams. Soon, I could draw them all out from memory. After graduating from high school, I got a good job in an RF telecommunication regulation station where I maintained short wave receivers and test equipment. I can still recall the very high quality R-390 and 51J4 receivers, the professional Akai and Philips tape recorders, and the Tektronix test equipment that we used. It was at this time that I began studying electrical engineering at university. After completing my studies, I was selected by the South Korean government to be one of twenty electrical engineers in a very special one year course in RF microwave telecommunications. We studied electrical and electronic theory, radio frequencies, x-rays, lasers, radiation, the theory and structure of transistors and tubes, the theory of filtering and matching circuits, in other words, all areas pertaining to electronics, with all the applicable mathematics, in order to thoroughly understand how to wirelessly transmit information and music. That one year course was equivalent to two years of postgraduate study. Nowadays, with hand held cellular phones, it is possible to communicate at any time and at any place. Back then, it was a very new concept in the earliest developmental stages and far from being the common convenience that it is today. I then became one of the team members, along with my fellow electrical engineers from the course, employed in a government project to build a large microwave telecommunications network. I was involved in that program for nearly one year before it was completed. I then left and joined a private company that installed and maintained VHF & UHF telecommunication systems because it would give me plenty of free hours. During that time, between 1969 and 1975, I returned to designing and building custom audio systems, utilizing my own ideas regarding semiconductors. At that time, everyone was talking about and focusing on using transistors. We completely forgot about tubes because it is so much easier to build high power amplifiers with transistors. I built amplifiers and receivers with 20 to 200 watt outputs per channel. "We produced more than 30,000 tuner modules that used semiconductors." In 1976, I set up my own company doing R&D and producing amplifiers and receivers. Because of my background in RF transmission, I had the greatest confidence and success with tuners. We produced more than 30,000 tuner modules that used semiconductors. The second largest production series was general purpose amplifiers, and the third one was ultrasonic high power industrial quality amplifiers with power outputs between 100 and 1000 watts. In 1988, I closed my company and opened an R&D consulting office. The first project was a Karaoke system using digitally generated sound rather than studio recordings of actual musical instruments. It required Digital to Analog converters and special compensation circuits as an interface. This work was very creative and state of the art for its time. I designed special compensation and on/off switching circuitry using op amps and diodes. This was required to hide digital noise and make the sound closer to the sound of a piano or drum or any other instrument. This work was like audio sculpture; carving out the right sound required a fine touch. Eventually, I achieved a reasonable result and the first production Karaoke systems were manufactured and have been in production ever since. This work took me ever more deeply into understanding the various underlying technical reasons why reproduced music sounds as it does. During that five year period, I also designed high power car audio systems using bridged power amplifiers. By 1995, the use of cellular and PCS phone systems in the telecommunication field began to flourish all around the world. Successful application of that technology requires base and repeater stations to link hand held phones and switch boards. I had specialized background knowledge in special RF high power amplifiers for such repeater stations. I decided to become involved in the field once again because of my love of the high technology R&D work required by high power amplifiers. I joined a high tech company as a senior engineer and was deeply involved in such projects until 2000. Among them were RF high power ultra linear amplifiers for UHF and Microwave telecommunications with 50 to 120 watt GaAs FET amplifiers and 100 to 500 watt GOLD MOSFET amplifiers. The required frequencies ranged between 900 MHZ to 2.5 GHZ. More than 120 types and models were developed. It required extremely delicate work and great focus to achieve the desired specifications. Most of these developmental programs successfully achieved their design objectives. I retired in 2001. In 2003, I returned to my first love, the long standing passion to reproduce the beauty of music with natural sounding components. I started Sam's Audio Labs to restore and upgrade vintage and high-end audio units for audiophiles, collectors, and, especially, music lovers.